In the world where choice of everything is so huge, it is impossible to believe that there are only a couple of roulette games. Players need some changes that make game a little bit different from that variant they’ve got used to. The first step to make this game a little bit different was introduction of double zero pocket. That created American roulette version. With introduction of call bets and La Partage and En Prison rules, French game variation appeared. But very soon these games became quite common and players started to look for other games to play. New and new roulette variations started to appear and though they are rather famous among roulette lovers, they cannot be met at all casinos. Mini roulette has the same rules as all other roulette games, but its main distinction is the number of pockets that are introduced into the reel. 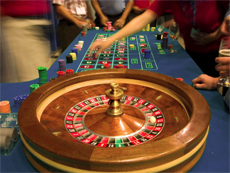 Compared with games with 36 numbers plus zero-number pockets, the total number of mini roulette pocket is really low. This game can rarely be found at traditional casinos, though online gambling houses frequently offer software for playing it. For example, William Hill has several roulette games like this one and you can try mini roulette game right now! This is probably one of most-loved roulette variations by all players. This game has rules of French roulette game and some very lucrative detail which makes players choose this game. The jackpot prize. As you know, each of the gambling houses has two types of jackpot, progressive and non-progressive. Royal roulette can be one of those types. Of course, it is not easy to win jackpot playing this game, but even the small chance of hitting it can be quite a good inspiration to continue playing. This game can hardly be found at traditional casino and even online casinos not always provide it for the visitors. No zero roulette game has the perfect odds for players as it has no zero pockets! As you know, American roulette has higher house edge because it has 2 zero pockets players cannot place bet on), European roulette has only one zero pocket and the house edge of this game is twice lower. With No zero game 50/50 bets became really great decision, as there is no situation when you place one bet for red, other for black, and the winning number is zero which means that you lose both of the bets. There are also some other roulette variations but these three are really worth to be mentioned. If you once see them in online or traditional casino, just give them a try and you will see how great they are.